After much delay, the new Sonoma Marin Area Rail Transit (SMART) commuter line will be in full operation between San Rafael and Santa Rosa in the North Bay sector of the San Francisco Bay area. The rail service is designed to offer an alternative to often-choked highway 101. Next year, the line will extend its southern terminal to Larkspur, where travelers can connect with the Golden Gate ferries to downtown San Francisco. Later extensions will go north to Cloverdale. The line operates with modern diesel multiple-unit trains (DMU), initially with two cars, but expandable when traffic warrants. Access from car-level platforms is easy. Fares range from $3.50 to $11.50, with half-price discounts for seniors and youth. Weekday trains will operate 17 times in each direction. 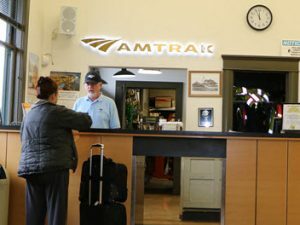 The northern rail terminal is named “Sonoma County Airport,” but the train station is a long schlep — a bit more than a mile –from the airport terminal. Not recommended for anyone with a lot of baggage. Given the recent addition of many flights, however, a shuttle of some sort may well be in the system’s future. Outstanding post but I was wondering if you could write a litte more on this topic? I’d be very grateful if you could elaborate a little bit more. Cheers!